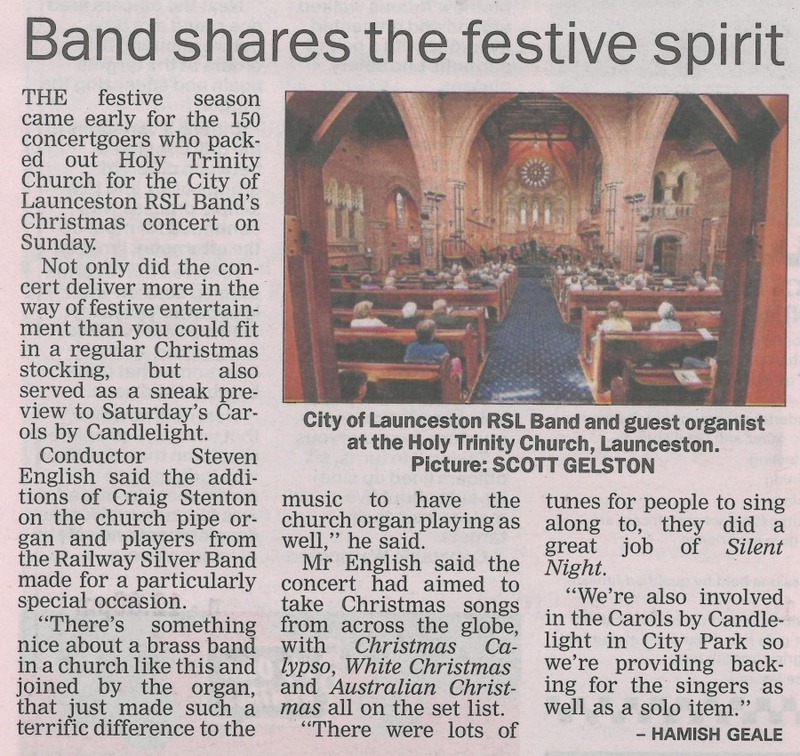 commented on "City of Launceston RSL Band and guest organist at the Holy Trinity Church, Launceston. Picture: Scott Gelston. ..."
City of Launceston RSL Band and guest organist at the Holy Trinity Church, Launceston. Picture: Scott Gelston. The festive season came early for the 150 concertgoers who packed out Holy Trinity Church for the City of Launceston RSL Band's Christmas concert on Sunday. Not only did the concert deliver more in the way of festive entertainment than you could fit in a regular Christmas stocking, but also served as sneak preview to Saturday's Carols by Candlelight. Conductor Steven English said the additions for Craig Stenton on the church pipe organ and players from the Railway Silver Band made for a particualry special occasion. "There's something nice about a brass band in a church like this and joined by the organ, that just made such a terrific difference to the music to have the church organ playing as well." he said. Mr English said the concert had aimed to take Christmas songs from across the globe, with Christmas Calypso, White Christmas and Australian Christmas all on the set list. "There were lots of tunes for people to sing along to, they did a great job of Silent Night." "We're also involved in the Carols by Candlelight in City Park so we're providing backing for singers as well as a solo item."